Permanent landscaping structures such as retaining walls and solid fences can be designed to not only look nice but also to divert potential stormwaters. However, sometimes you need to set up more protection as a temporary solution in times of particularly heavy rain. Sandbags are used by both municipalities and homeowners, as they are cost effective and provide way to temporarily divert stormwater from structures. 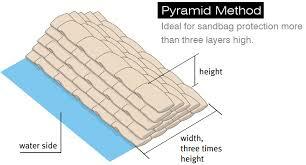 It is good to have some basic knowledge about sandbags to help you when the need arises. In addition to information shown here, always check “Ready Ventura County“, the website of Ventura County Sheriff’s Office of Emergency Services (OES) in the event of any emergency. The OES maintains the site in partnership with a number of County agencies and departments to provide critical information as emergencies occur. The OES website is a great way to learn disaster preparedness and to find contact information for the participating agencies and departments. More information about sandbags is also available from Ventura County Fire Protection’s “ready set go” guide. When sandbagging, work in pairs: One person holds the bag while the other shovels in the fill material. Close weave burlap is best and size is optimum at about 18″ x 30″. A common mistake is to overfill the bags. Bags should be about 1/3 full—certainly no more than half full. Extra movements like turning and twisting your body while filling bags may result in injury and fatigue. Watch your footing and posture. When many bags are needed, have helpers form a sandbag passing line or “chain”. The team stands in two parallel lines facing each other and slightly offset from one another. The bags are passed down the center of the chain, being careful to pass rather than toss bags. Sandbags are usually folded at the top, but if you are using the tying method, use a little less sand and tightly twist the bag before applying an overhand or “pretzel” knot. If you are using the folded top method, be sure that the fold is placed away from water source and at a 45-degree angle to the bag. Place each bag over the folded top of the preceding bag and stomp into place, staggering bags over the seams of the preceding layers. The flap for the “key sack” at the topmost position should be folded under to prevent its opening. Wood barriers and/or plastic sheeting can be used in combination with sandbags as effective means to protect sloping terrain. Swift moving water is deceiving. It may look safe enough but as swift moving storm water will sweep vehicles away, imagine what will happen to someone standing knee deep in it. Sandbags are heavy. Provide a stable, wide base for each layer. You do not want to stack too high and have them to topple over on you or someone else. Sandbagging means other people may be using shovels and moving quickly, sometimes in the dark, so be careful. Downed power lines are an especially important danger during storms. Call authorities and stay out of surrounding water. Natural gas and propane may be present too. Keep mindful of displaced wildlife and other animals which may be seeking higher ground—avoid touching them. 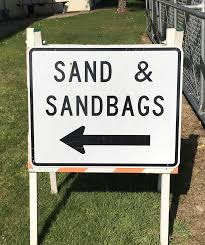 Dress appropriately while sandbagging. Boots and gloves, are essential. More protection is needed if working in the dark or around vehicles and equipment. A complete first aid kit should be on site. Take a break when you can. Exhaustion, stress and sleep deprivation all have adverse effects. Be aware and be careful! There are many ways to get into trouble out there if you are shoring up your flood protection during a storm. Fire Departments will typically have sandbags and sand to fill them during the rainy season. However, during dry months this is not usually the case. The Ventura County Fire Department provides a list of local retailers you may wish to visit to stock up on sandbags and supplies. Check your local fire department to see what the restrictions may be, as most place a limit, such as 10 bags, per request. Scroll down to find local retailers who generally have sandbags for sale. Sand and sandbags may be purchased from the following retailers. Prices vary. Other retailers may be available in your area. This list courtesy of the Ventura County Fire Department. Ask a Question, Report a Problem or Concern!